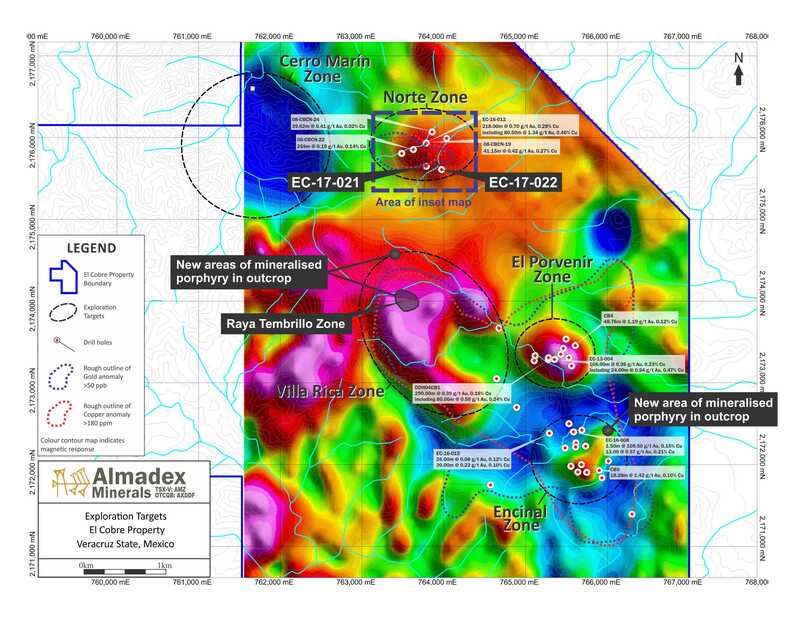 Almadex Minerals Limited is pleased to announce it has received assay results from holes EC-17-021 and EC-17-022 of the 2017 Norte Zone drilling program. 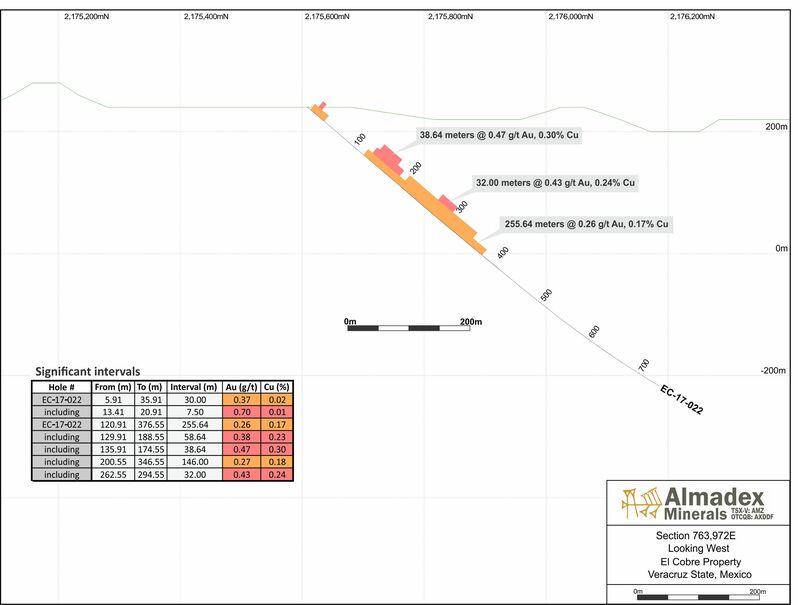 Almadex is also pleased to announce that a new area of exposed stockwork quartz veining and gold mineralisation in the Encinal Zone of the project has been identified. The Encinal Zone is located roughly 3.5 kilometres to the south-southeast of the Norte Zone drilling and 2.5 kilometers southeast of the recently identified Raya Tembrillo Zone of stockwork veining. Almadex has collared a hole which is currently being drilled to test this new area of veining in the Encinal Zone. 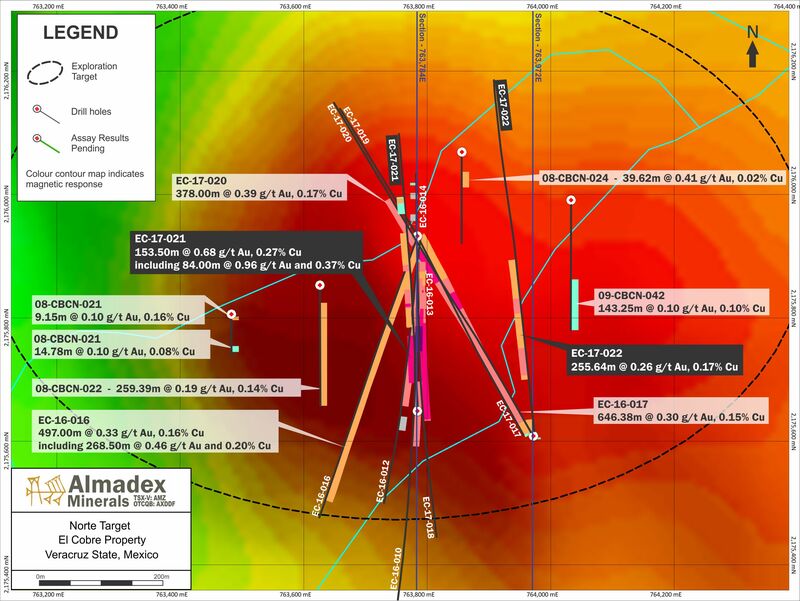 J. Duane Poliquin, Chairman of Almadex commented, "We are carrying out a systematic drill campaign to follow-up these results in the Norte Zone. 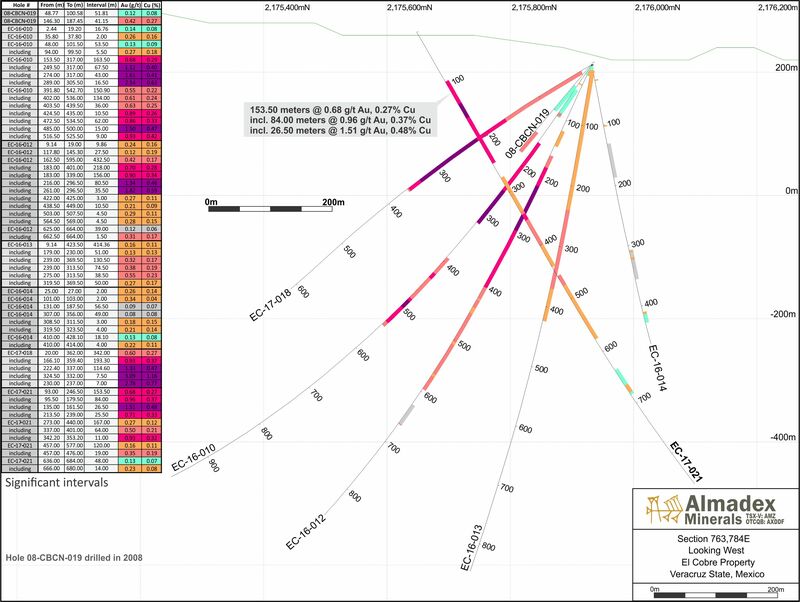 Elsewhere on the project we are conducting mapping and sampling preparatory to drilling other zones. This work already has defined previously unknown mineralization in the Villa Rica Zone and now an area of stockwork veining cropping out in the Encinal Zone. We look forward to reporting further results in the coming weeks and months as the programs progress." Work is underway to provide access at the newly discovered Raya Tembrillo target, located in the Villa Rica Zone, roughly two kilometres to the south of the Norte Zone. Larry Segerstrom, M.Sc. (Geology), P.Geo., A Director of the Company, is a Qualified Person as defined by National Instrument 43-101 ("NI 43-101") and has reviewed and approved the contents of this news release. The porphyry mineralisation reported in this news release is associated with broad areas of alteration and stockwork veining. True widths cannot be determined at this time. The analyses reported were carried out at ALS Chemex Laboratories of North Vancouver using industry standard analytical techniques. 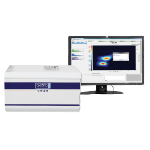 For gold, samples are first analysed by fire assay and atomic absorption spectroscopy ("AAS"). 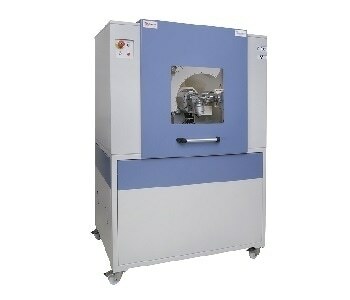 Samples that return values greater than 10 g/t gold using this technique are then re-analysed by fire assay but with a gravimetric finish. 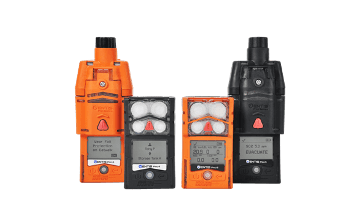 Blanks, field duplicates and certified standards were inserted into the sample stream as part of Almadex's quality assurance and control program which complies with National Instrument 43-101 requirements. A technical report on the El Cobre project prepared in accordance with National Instrument 43-101 and entitled "Technical Report on the El Cobre Property", was filed in May 2015 and can be obtained from www.sedar.com.